Truly, all things have a master. 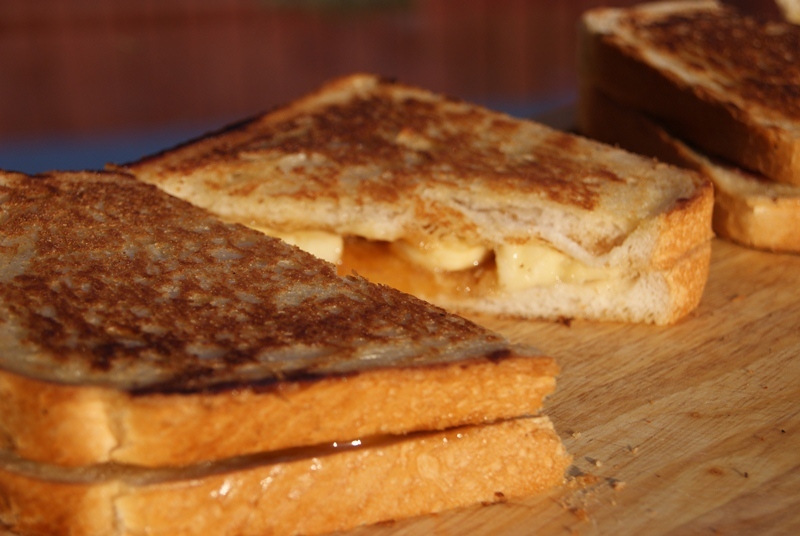 In the Halls and Shrines of the Great British Toastie, that master is surely the Banoffee Toastie. I shall introduce you, and then we shall talk some more. Butter the bread on the outside, and place reverently on a board, butter side down. On one half (the Chosen One), slice your banana and arrange artfully within. Eat the rest of the banana. Keeping your attentions on the Chosen one, sprinkle the dark chocolate upon it. Add a large spoonful of toffee sauce to the centre of the chosen one. 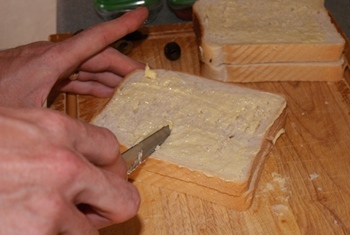 Brush the egg around the crust on both slices of bread and place the lesser half onto the chosen one, pressing gently around the edges. Assuming you do not have a toastie press, place in a heated frying pan over a medium heat and cook for approximately 2 minutes on each side, keeping a close eye out to avoid a tingeing of either slice beyond the colour of a glorious sunset. Serve to a rapt audience in silence and await the bountiful happiness that will be showered upon you. 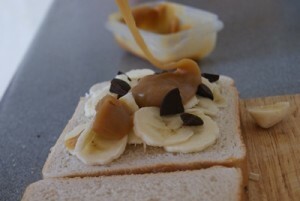 I had no idea that the banoffee toastie would warrant quite such ceremony, but it does. The miraculous creation has existed for quite some time in theory, and sounded very good, all things considered, but we had never actually tried it. Clearly now I can see that we were inadvertently already in awe of it, and thus feared to look upon it, but thankfully we did, and I would recommend it unreservedly, despite the tiny matter of the toffee sauce. Clearly the world’s best toffee sauce is always going to be home made, but no one has the time for that. I would therefore deem it excusable to purchase a jar of toffee sauce, but only on the understanding that the homemade version would be better. Here is the recipe, should you wish to appreciate the almighty banoffee toastie as the Beast intended. Dice the butter and place in a the pan with the sugar. Remove from the heat and stir in the cream. Lumps will form, but don’t worry about these. Return to the heat and stir until it starts to simmer, then pass through a sieve and cool. This can be stored for up to a month in the fridge, so you should be able to manage a few hundred Banoffee toasties in that time. It remains for me only to explain the chocolate. We are aware that chocolate is not a necessary component of banoffee. I make no attempt to excuse myself and declare that we tried both, and this was better. For true toastie glory you may need to come and visit us at a festival (next up is Uttoxeter Food Festival on 23/24 June 2012) for there the sauce will truly be home-made and the toastie press will be the real deal. Anyone disappointed with the toastie there will be committed to legend, have songs sung in their honour, then required to explain themselves.